Treasuries rallied, while the dollar fell after disappointing retail sales data in the world’s largest economy added to speculation the Federal Reserve will be in no rush to raise interest rates this year. American stocks dropped. Oil climbed. Yields on two-year U.S. notes, the coupon maturity most sensitive to Fed policy expectations, posted the biggest decline in two weeks. 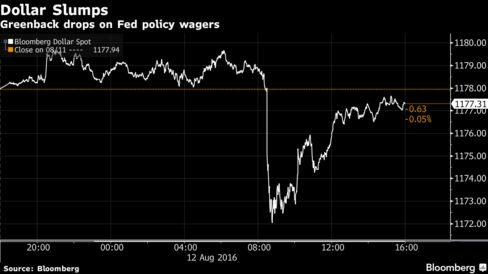 Meanwhile, those for 10-year bonds briefly fell below 1.5 percent as the dollar retreated. The S&P 500 Index slipped after hitting an all-time high. Trading volume with American equities sank to the lowest level since March. Norway’s krone led the currencies of crude-exporting nations higher this week as oil had its best performance since April in the span. Both global stocks and bonds rallied in the week, buoyed by optimism that central banks will support growth as the Fed takes a gradual approach in raising borrowing costs. Data showing sales at American retailers were little changed in July as wholesale prices unexpectedly sank by the most in almost a year reinforced that outlook. Futures traders now see 42 percent odds of a U.S. rate hike this year, down from 49 percent Thursday, data compiled by Bloomberg show. Treasury 10-year note yields fell five basis points to 1.51 percent as of 4 p.m. in New York, according to Bloomberg Bond Trader data. Two-year yields dropped four basis points to 0.70 percent. The implied probability of a Fed hike next month is just 18 percent, according to futures data compiled by Bloomberg, down from 26 percent a week ago. “We think the regime will persist so the policy rate can stay about flat over the policy horizon with just one rate increase,” Federal Reserve Bank of St. Louis President James Bullard said in an interview on Wharton Business Radio on Friday. U.K. gilts extended a fourth weekly advance as the Bank of England restarted its stimulus program. The central bank has left its quantitative-easing shopping list broadly unchanged for next week, even after it failed to attract enough sellers of gilts due in more than 15 years to hit its purchase target at an operation on Tuesday. Spain’s government bonds also posted their fourth weekly advance, pushing yields to record lows, as developed-market central banks kept their stimulus taps open. Yields on Italian 10-year debt Friday stayed close to their lowest level in more than a year. China’s 10-year bonds yielded 2.66 percent, the lowest level since at least 2006, as weaker-than-expected credit expansion and industrial output reignited concerns over economic growth. The Bloomberg Dollar Spot Index, which tracks the currency against a group of major peers, dropped 0.1 percent. The greenback lost 0.2 percent to $1.1161 per euro, and fell 0.7 percent to 101.25 yen. Norway’s krone extended this week’s gain to 3.5 percent as the currencies of Mexico and Canada, which are also oil-exporting nations, rose 2.8 percent and 1.6 percent, respectively. The pound fell for a second week amid the BOE’s revamped bond purchases that left the U.K. currency as, once again, the year’s worst performer. The pound is now back below $1.30 for as the easy money policies designed to shield the economy from the decision to quit the European Union take effect. Brazil’s real weakened after the central bank intervened amid comments by acting President Michel Temer that signaled he’s worried over the currency’s world-beating rally this year. The ruble pared its weekly gain as investors speculated a flare-up in tensions in Ukraine may lead to tougher sanctions against Russia. The S&P 500 fell 0.1 percent to 2,184.05, after closing at an all-time high for the ninth time in a month. The Nasdaq Composite Index eked out a 0.1 percent increase to its fourth record in six days, while the Dow Jones Industrial Average lost 0.2 percent. About 5.5 billion shares traded hands on U.S. exchanges Friday, the lowest in four months and 21 percent below the three-month average. Banks dropped as Treasury yields declined, damping optimism for better earnings. Drugmakers weighed on the health-care group, while raw-materials fell the most in five weeks. Energy producers rose with crude oil for a second day, and Nordstrom Inc. jumped 8 percent to buoy retailers after its quarterly profit beat projections. With the earnings season approaching its end, investors are turning their focus to economic data to gauge the vitality of U.S. growth and the Fed’s next policy steps. In addition to July retail sales and producer prices, a report showed consumer confidence rose less than forecast in August, reflecting a pullback in views on personal finances among younger Americans. MSCI’s global stocks gauge climbed 1.3 percent since Aug. 5, while emerging-market shares posted their longest weekly advance since March 2014. Commodity producers and automakers dragged the Stoxx Europe 600 Index down 0.2 percent, after it traded little changed for most of the day. The equity index, which erased its post-Brexit slump on Thursday, trimmed its weekly gain to 1.4 percent, with the volume of shares changing hands today about 39 percent lower than the 30-day average. Oil climbed 2.3 percent to $44.49 in New York, extending its weekly rally to 6.4 percent. Saudi Arabia signaled it’s prepared to discuss stabilizing markets at informal OPEC discussions next month after prices tumbled into a bear market. Gold and silver erased gains. Nickel led a slump in industrial metals after several economic reports from China revived demand concerns in the world’s top user of raw materials.